Overview: Our goal for this course is to provide Mechanical Engineers with the necessary skills to communicate ideas and thoughts more effectively. We often rely on our innate ability to solve problems and communicate them effectively to team members. 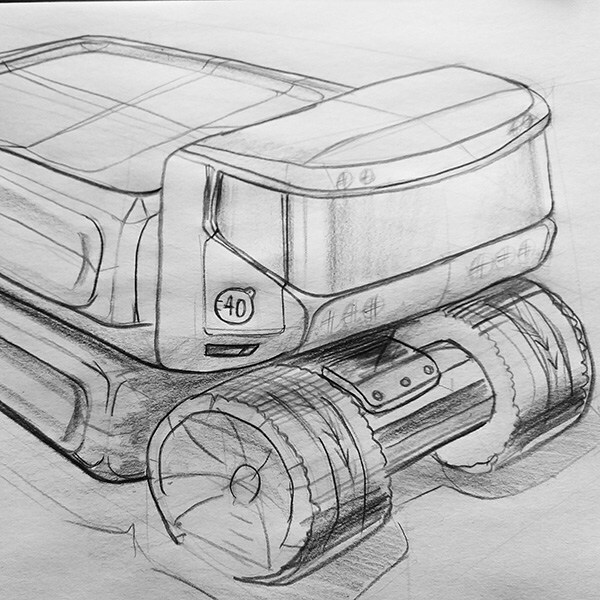 We simply help facilitate this process by providing participants the techniques for rapid sketch development. In this course, we teach you the basic principals of sketching; including line weight, perspective (2-point and 3-point), simple shapes, shading, lighting, shadows, composition/background, and investigative & explorative sketches. Also included, are marker rendering techniques using colored pencils, pens, and markers (cool grays/french grays/primary & secondary) to transform your early drawings into concept sketches. Learning how to create sketches in correct perspective and quickly will allow you to communicate your ideas in a professional manner. In addition to the sketching and the marker rendering portion of the class, we also cover similar techniques using a Wacom tablet. This is a quick and easy way to edit your sketches in digital form. We focus on using two types of software (available for purchase), Autodesk Sketchbook Pro and Sketchbook Designer. The Wacom Tablet is a monitor that you sketch directly on to using their patented pen input technology – no more paper, smeared ink, or scanning. Using the Wacom allows you increase productivity while minimizing cost and time. Itʼs a great tool (in conjunction with the software) that allows you to quickly develop and edit your sketches and/or concepts directly onto the computer. Prerequisite: An open mind and a willingness to learn.